Get stronger, leaner, and improve your technique with one-on-one personal training! Exclusive to Spire members, we now offer one-on-one and couple's personal training, individualized exercise programming and nutrition assessments designed specifically for you and your goals. Whether you want to be a stronger climber, lose weight or learn proper lifting technique, we'll help you achieve your goals. Schedule an Athlete Assessment or Personal Training session with our experienced, in-house certified personal trainer today! Meet our Coach: Philip Ferrara, M.S., C.S.C.S. Philip Ferrara is a passionate trainer, researcher, and physiologist with nearly a decade of climbing experience. He is also an NSCA-Certified Strength and Conditioning Specialist (C.S.C.S.) with 4 years of personal training experience. Phillip earned his undergraduate degree from the University of Georgia in dietetics, focusing on sports nutrition. 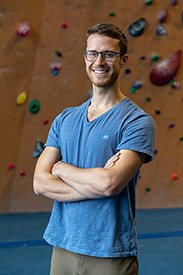 He then obtained his master's degree from Montana State University in exercise physiology and nutrition sciences, where he studied finger strength and fatigue in sport rock climbers. His work has been presented at conferences around the world, including the International Rock Climbing Research Association's biennial meeting. "Working with Phil has had a major impact on my climbing. I feel more confident in my leading and have been leading full number grades harder, both inside and outside, since working with him. His commitment to making a manageable, thoughtful and customizable training plan has [...] made me more confident in my climbing..."